Tap your favorite spirits in geologic style with Jeff Henderson's cobbled granite drink dispenser. 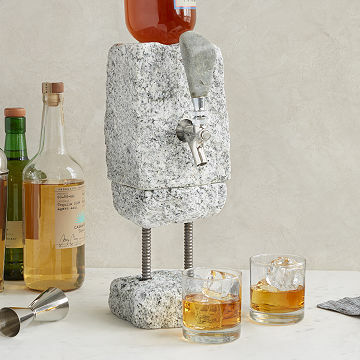 Enjoy your favorite spirits on the rocks—or from the rock to be more precise—with this unique stone drink dispenser. Crafted from rough-hewn, cobbled granite equipped with a stainless steel tap, Jeff Henderson's sturdy bar fixture dispenses wine or spirits with ease while celebrating the natural beauty of stone. Details like the naturally tumbled beach stone handle on the tap add organic sophistication to this functional design. The custom plug is there to assist with refilling your dispenser without inverting the weighty design. Simply open the bottle, re-cork it with the plug, insert the bottle into the dispenser, and remove the plug by gently pulling the cord. You're ready for another gravity-fed drink! Add the sculptural granite and stainless steel stand (sold separately) to elevate the dispenser and fill your glass more easily. Cheers! Handmade in Eliot, Maine from locally sourced New England stone. Click here to learn how to use your Stone Drink Dispenser. A true believer in using what's around you to create more beauty, artist Jeff Henderson is fond of saying, "The real artist is Mother Nature...and we just drill the holes." His rustic designs are handcrafted from naturally smooth stones locally sourced from coastal New England, as well as from roughhewn, cobbled granite. Square Granite with Stand: 5" L x 4.5" W x 14.75" x 15.5" H; approx. 24.6 lbs. Square Granite: 4" L x 4.5" W x 7" H; approx. 13 lbs. Stand: 5" L x 4.5" W x 7.75" x 8.5" H; approx. 11.6 lbs. I submitted a review about the main piece and this is the 2nd piece to buy in order for it to look like the photo. My Husband was so happy with this as was I - not your normal present, and the craftsmanship is incredible so thank you. This is a show piece in our bar and everyone who sees it wants to know where I bought it. So versatile and so unique we love it! Perfect for my boyfriend who enjoys bourbon and wanted something to display that was also useful. I saw this and knew my boyfriend would love to add this to our bar. Make sure you close it all the way or there will be a little dribble, otherwise the product is great! It's beautiful, original, great quality and stylish. My husband absolutely loved it! This product was a gift from my brother. I ordered the product ans when he opened it, it was not the completed product. I called and emailed the company and they were prompt at getting back to me. It ended up being a miscommuncation between what I thought was ordered and what I had initially received. There was ABSOLUTELY no hassle and COMPLETE undertsanding in regards to the order. Within a few days my completed product arrived without any complications. I was very grateful for their kindness and understanding throughout this process. I highly recommend this company. My brother absolutely LOVES the product and him and I both highly recommend it. By the way, he has experienced NO LEAKING!!! Thank you again, Uncommon Goods. I will definitely be ordering with you again. I was told that this was only to be used for parties ( by the lady in the office), and not meant to be used for more than 3 weeks. Maybe you should mention that on the web site. Very unhappy to have spent this amount of money for something that is only for show. So sorry, We don't try to finish a bottle at a party! I cant even feel comfortable selling this at a garage sale.